Crisis-trained Billy Graham Rapid Response Team chaplains have prayed with more than 20,000 Californians in the aftermath of the Camp Fire—the deadliest and most destructive blaze in the state’s history. Many people have heard the common phrase “walk through fire,” but in the past week tens of thousands of Californians have lived it. On Nov. 8, flames broke out in the northern part of the Golden State and quickly spread through Butte County. Nearly obliterating the town of Paradise, the inferno has consumed more than 10,000 structures, burned over 100,000 acres and claimed 60-plus lives. Another blaze—known as the Woolsey Fire—began in southern California the same day, taking another three lives less than a week after a nearby mass shooting in a bar. Firefighters continue to battle the two infernos, and search-and-rescue crews are looking for hundreds still missing. The smoky haze covering surrounding areas is a stifling reminder to residents of their new, uncertain reality. 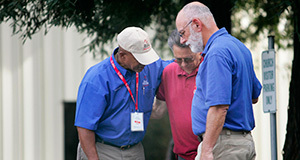 Billy Graham Rapid Response Team (RRT) chaplains have deployed to offer hope and comfort to those hurting. A team of 11 chaplains is currently in Chico, California, less than 15 miles from the hard-hit town of Paradise. The city is packed with thousands of displaced evacuees. Chaplain Coordinator Pam Rhodes noticed survivors and communities are not acting like they’re devastated as much as “they just want to know they’re not alone in this—and they’re not. “Jesus will never forsake them,” she said confidently. Sipping her morning coffee, Kellye Wulff’s curiosity piqued as more than a handful of blue-shirted men and women passed by her in a local restaurant. A week into the Camp Fire, she was used to seeing new groups in the area coming to help. “Who are you with?” she asked. The chaplains turned and said, “Billy Graham,” explaining their role as a ministry within the Billy Graham Evangelistic Association. “Thank You, Lord!” Wulff responded. She sat in a booth across from her mother, Anita Harris, and welcomed two of the chaplains to join them as they finished up breakfast. Crisis-trained chaplain Judy Malavazos slipped into the seat beside Wulffe, who said her house was destroyed in the fire in Paradise. Recognizing that Wulffe had faith in the Lord, Rhodes thought of Isaiah 41:10. Wiping tears, Wulffe said, “I’m so thankful I have Him to lean on. >> View photos from the California wildfires. “He’s our hope,” Malavazos said after hugging Wulffe. Jonathan only relied on himself. After all, he’d been burned in more ways than one. From the town where the massive blaze originated, he managed to escape. Jonathan shared his fire story with crisis-trained chaplain Mike How. “The Lord provided for you,” How encouraged him. Jonathan said he didn’t believe in “religious stuff,” but considered himself a reverend. Intrigued, How asked what church he belonged to. After listening to Jonathan describe his personal beliefs, How chimed in. For nearly an hour, Jonathan opened up about his views on the church—how people in church mistreated him and his belief that the church’s purpose was a fundraising scheme. Fed up, he decided to develop a system of his own. “It’s my turn,” How said, pulling out a “Steps to Peace” booklet. The simple tool developed by BGEA explains how to have peace with a loving God. After flipping through the pages, Jonathan wanted to know more. “Please explain the rest,” he said eagerly. “Please, I really want to know about your Jesus. Finish. How told him he could have a personal relationship with a heavenly Father instead of working through life. In response, Jonathan prayed to receive God’s forgiveness. “I’ve got to go look for a biblical church,” Jonathan exclaimed. He had a great smile on his face that hadn’t been there before. Jennifer stepped out of her minivan with her two young sons, each wearing a face mask. “Do you know of someone who can sift through our things?” she asked Pam Rhodes in the parking lot. Rhodes took the trio inside and got Jennifer’s contact information for Samaritan’s Purse. She then made sure Jennifer was OK spiritually. Rhodes found it for her: Isaiah 6:1-3. “Scripture takes people through the process of what they go through long-term,” Rhodes explained as Jennifer became teary-eyed. A mother herself, Rhodes wanted to make everything right for the young mom but knew she couldn’t. Instead, Jennifer will have to learn life’s lessons on her own, letting the Lord grow, teach and heal her. Together, they talked through how God will use the things she’s going through to help others, exemplifying the “oak of righteousness” mentioned in Isaiah 61:3. “I really believe that,” Jennifer said. Despite everything, it seems God is beginning to sift through her heart to reveal trust in Him, bringing beauty for ashes. Do you trust God through life’s trials? Start a relationship with Him today.